David Cowan relates a “web of strangeness” in his article ‘ Timeslips, a Cat Circle and the Ghost Train of Balquhidder’ (last edition of this newsletter) and his detailed report gives a very strong pointer to what was going on in the brains of those who experienced the phenomena described. It is a brave person indeed who commits such events to paper, but, happily for us, the couple concerned have inquiring minds and are interested in the rationale for their strange experiences. Three factors are of prime importance to paraphrase estate-agent-speak – location, location and location. But we must add a fourth. Apart from natural earth energies generated at places where phenomena are reported, there are the magnetic fields generated by the car itself, and by the reactive fields of transmitters nearby. The area is most interesting seismically. There are six earthquake epicentres all within two miles of one another on opposite sides of the town of Comrie. In 1842 appearances of fire and light were seen well before daybreak, with a light so brilliant that birds could be seen in the trees. Such effects have been reported from all over the world prior to earthquakes1. All areas within seven miles of this fault zone are considered by Davison to be affected periodically. The Ochil fault extends for nine miles, Menstrie had some 200 tremors and quakes between 1736 and 1916. Strontian, to the West, has had recent quakes and there is a fault from Kinloch, at the head of Loch Teacuis to Loch Sunart. Anderson said that “The Great Glen, Highland Boundary and Glenn App faults are moving even at present”2. As our area is on the Highland Boundary Fault, this has especial relevance – the term ‘ at present’ in geological terms has a far wider connotation than the years concerned. There are outliers in Kintyre, near Crieff and near Blairgowrie. It may be remembered that Blairgowrie has long been considered as a ‘hot spot’ for visible phenomena. Yes indeed, why not? There are dozens of such reports in the literature over centuries. This is probably outgassing, from movement of the rocks below the water, when the gas emerges as a giant bubble – the green colour may reflect the chromatic effect of deep water or possibly ionisation or sonoluminescence. Corliss lists a great variety of shapes, colours, rays, patterns and balls of light in his “Lightning, Nocturnal Lights and Related Luminous Phenomena”. The clarity and accuracy of this report will add to the literature on anomalous light forms. There is a vast range of perceptions or a continuum if you will, between the simple ” I am here, I am aware” through ” Whatever was that?” which may be a sensation of touch, a feeling of sudden cold for no reason, maybe a vivid flash of a tiny brilliant light, which bears no relation to the environment, and so on, to “Why did I smell those lilies?” when there are patently none there, etc. The trickster in all these cases is the brain, 3lbs of grey and white matter, with billions of neurons and dozens of complex structures, all cross-linked and all, when functioning normally, directing our lives. But sometimes a blip triggers some unexpected cross-linking and we may see, smell, feel or taste something that is not truly there. As Professor Zeki wrote recently, hallucinations are normal but they are not things which the neurologist wishes to concern himself with. Similarly the optician and the doctor would perhaps rather distance themselves from strange tales. The line of white picket posts seen by the couple when driving along beside Loch Earn is very reminiscent of the line of black rectangular posts seen by another woman who has told me of her strange experiences. The picket posts were virtual, not real images. Geodetic measurements (vertical motions) increase as the elastic strain in the earth builds up prior to a tremor or an earthquake. Reservoir induced seismicity is also found as is mining seismicity. Rock bursts and bumps will occur and tremors also. In the area under scrutiny, we find old lead mines, old gold mines and several man-made reservoirs. Then there are shear waves, polarised energies created by stressed rocks, which run for miles across the land. So energies are out and about and certainly alive and well in Scotland, a highly faulted region with the Great Glen fault, which runs from Inverness to Mull, the Highland Boundary Fracture Zone which runs through our area en route from Stonehaven to Crieff, Callender, Aberfoyle and on past Dunoon. Just as a rapid climb up and down several steep ladders will cause anyone’s heart to pound, so walking or driving over steep magnetic gradients and angles of dip can affect sensitive people. 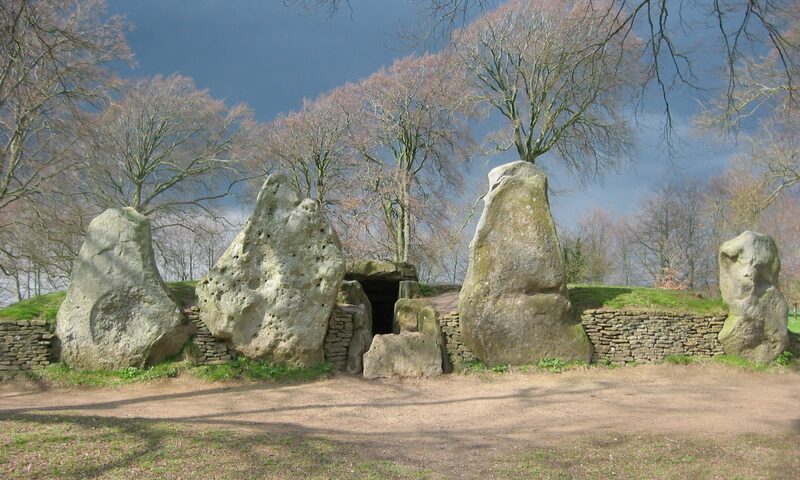 For example at Groton, Connecticut, there is a prehistoric site, a stone chamber, where under the capstone, 700 milligaus at 59 degrees dip is measured by the geomagnetometer, but 10 yards away the field has dropped to 300 milligaus at 68 degrees dip. At this well, named “Cliff of Tears”, very many visitors start to weep and feel very depressed. Nose and gum bleeds are common. Regarding the relationship between earthquakes and the geomagnetic field, Kato4 has reported that severe earthquakes are usually preceded or followed by anomalous magnetic change in the neighbourhood of their epicentre. He attributes the source of this magnetic change to changes in rock magnetism. Powerful transcurrent movements can be demonstrated on faults in this area. For example, the Ericht-Laidon Fault of 4.5 miles, the Tyndrum Fault of 3 miles and the Loch Tay Fault of 4 miles. A major NW fault is at the Pass of Brander near Oban5. It is not generally realised that the human body emits frequencies as radiation in the ELF, RF, MW, and IR and UV bands and will itself act as an efficient absorber of such energies, with maximum efficiency in the RF band. In man-made signals, these are the radio and television bands. But it is also a fact that the earth itself emits the same energies in addition to those from TV and radio masts. Imagine a flat rock face with several deep cracks in it. Now pour on water; it disappears down through the cracks in the rock. But these same rocks will allow energy from far below to percolate upwards through the same cracks. Where a granite block extrudes through the earth the energies are higher at the junction of the block and the surface. A surprising source of high levels of magnetic field is a car. They are quite dominating compared to the electric fields – there is low-voltage and high current in cars. There is considerable spatial variation depending on the location of the battery. The highest levels are found at the seats of the driver and the front seat passenger where they have been measured at levels between 13 microTesla and 700 microTesla. But levels vary considerably between different car models, with the highest found in cars with the battery located at the rear of the car. these can be some 10 times higher than with those with a battery in the front of the car. The engine ignition sequence is the totally dominating source of the magnetic field. When driving, the wheels and tyres, in particular those with metal cords in the tyres, often become permanently magnetised. This then causes an AC magnetic field when the car is in motion. Sustained pulsing, as in trains of clicks, or even car horns, can trigger the brain to time distortions, as will heating the brain – here time appears to pass very slowly. The substantia nigra pumps out dopamine, which helps to set the pace of the body clock. In the basal ganglion, nerve signals “ loop the loop” to mark the passage of time. Interference effects that affect this continuous loop of nerve signal will distort our perception6. This is a rare but well-documented phenomenon when the brain and visual system act from an external stimulus to present a virtual image in front of an individual, as real as if it was actual, but it is always a composite of previously seen images, smells and sounds. The comparator of the brain has assembled an image that is utterly anomalous in the context of the surroundings. It is possible that the sign to Oban was just such an image, as was the bridge that wasn’t there. The writer knows of several examples from her own patients, reported over the years, and there are many in the neurological literature. One man, for example, approaching a haunted pub two years ago, with other people, “saw” instead of the pub, a very old building in the West country, a lake, a line of trees, but no buildings. Yet his companion saw only the pub and houses around it. This is interesting and logical, the 30 – 50 cats sitting in a circle right across the road. Cats are known to love places of high electromagnetic energy – they love to sit on television sets, computers, and as I well know, the batteries of cars in a garage. So we ask, what was the source of high energies at this road site? Perusal of the Ordnance survey map may supply the answers. Muthill is on the Highland Boundary Fracture Zone fault and is also extremely close to a transmitter mast. No wonder the cats were having a “happy time” sitting around on the road. Interestingly a friend of mine saw the same thing with cows very close to Arbor Low in Derbyshire some years ago. Electrical stimulation of certain regions of the temporal lobes produced strange feelings about the actual situation. For a BRIEF period everything seems to be more intense and more significant. Another feeling is that of being out of touch with reality – exactly as described by this couple “everything looked strange, there were no cars, not even parked. I was sure that something had happened and that we were dead or unconscious, travelling in limbo. It was not until we passed the sign for the trout farm in Comrie that things suddenly became normal, with street and house lights and parked cars – all as it really should be”. As Professor Peter Nathan7 describes in ‘The Nervous System’, “everything has an unreal atmosphere.. everything seems to be slowed down …. even their own movements seem as if they are carried out in slow motion. Everything seems .. unreal”. External magnetic fields can trigger nerve activity in the brains of some people. A field only a hundred times stronger than earth background will do the trick. And as the couple were driving back and forth over faults and thrusts and on the road to Killin and at Balquhidder on the way to and from Callander, they were very close to two high transmitting masts. In all of us, an endogenous polarised signal is running constantly from back to front of the brain, down the calcarine fissure. But if this is nulled, by an external, equal but opposite signal, the “Where am I, what am I doing here?” feeling is experienced. And this is surprisingly common in people to judge from the responses I have had to the question in lectures over many years. And of course it is where this occurs that is so relevant. People are seeing a familiar scene but all is strange and unreal – not like ordinary life. There are certain predisposing factors that can and do cause hypersensitivity to electromagnetic fields and can in extreme cases produce the syndrome known in Sweden, Japan and the USA etc., as electromagnetic hypersensitivity. But this applies to but a small percentage of people. The response of the system to electrical currents depends on the state of the system itself. Moderate magnitudes of electricity do not produce permanent changes in the system when it is in a globally homeostatic state. But when the system is or has been stressed, whether due to drugs, trauma, shock, pathological conditions or subclinical conditions in the continuum of anomalous human effects, or electric shock or lightning ‘splash’, it is very much more vulnerable. Extreme magnitudes of electrical current lead to the detriment of the system regardless of its stake at the time of application. All energies have highs and lows, peaks and nulls due to interference effects whether from water reflection or metallic surfaces in a very similar fashion to the way light itself reflects. In those who are very tired or stressed as this couple were from their statements, images will affect people differently. For example: – “We were a little agitated as our schedule was collapsing rapidly”, “as I was rather tired and driving carefully”, “after a very fraught and fractious day”. The curious report of the sign to Oban five miles away, when by all logic they were some 50 miles away may have two possible explanations. Firstly it may have been perseveration of vision (they had visited Oban before) whereby the brain produces an image of something seen and subconsciously remembered from years before. Secondly it could have been a very rapid contraction of the visual field (fugitive tunnel vision) and they were in fact seeing only the central part of a longer word. Seven irreversible changes in blood pressure can produce such an effect. If, for example, the word “Doncaster ” is on a sign, the eye may “see” only “cas” and miss out the “Don” and the “ter”. Strange, yes, but true. We have in these reports a 20th century description of what the Romans called the “genius loci” – the spirit of place. We owe the couple a debt of gratitude for their open reporting of wonders seen – and unseen.